Wafum / Ponar Wrockaw TUR-63 25” x 80” Geared Head Lathe s/n 40954 w/ 18-1800 RPM, 3 ½” Thru Spindle, Inch/mm Threading, Tailstock, Steady Rest, Trava-Dial, 18” 4-Jaw Chuck, 16” 3-Jaw Chuck, Mimik Hydraulic Tracer, Tool Post and Holders. Blanchard Rotary Surface Grinder s/n 162 w/ 30Hp Motor, 25” Magnetic Chuck, 18” Grinding Head, Coolant. Warner & Swasey / Norton mdl. SW-4-VAI-Z 10” x 18” Automatic Surface Grinder s/n 120160878 w/ Auto Cycles, Wheel Dresser, Fine-Line Electromagnetic Chuck, Coolant. Harig Super 618 6” x 18” Surface Grinder w/ Walker Magnetic Chuck. Enco mdl. DS-20 20” Pedestal Disc Sander. Baldor, Delta and Miller Bench Grinders. Dayton 1” Belt / 8” Disc Sander. Powermatic mdl. 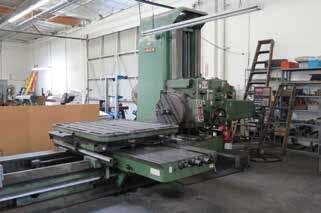 87 20” Vertical Band Saw s/n 487072 w/ Blade Welder, 37-4500 Dial FPM. Sunnen MBB-1290 Precision Honing Machine s/n 11612. Rockwell mdl. 15-081 Pedestal Drill Press. Curtis 5Hp Horizontal Air Compressor. Essick 5Hp Horizontal Air Compressor. 18”, 14” and 12” Rotary Tables. 10” Compound Rotary Cross Slide. Yuasa 8” 3-Jaw Indexing Chuck. (3)Criterion Boring Heads w/ R8 Shanks. Angle Masters and Angle Plates. Insert Tooling and Carbide Inserts. Carbide, and HS Endmills, Taper-Shank Drills, Drills, Taps, Reamers, Broach Sets. Mitutoyo PH-350 13” Bench Model Optical Comparator s/n 10359 w/ Surface and Profile Illumination. Cadillac 24” Pla-Chek Height Gage. DoAll Gage Block and Height Block Sets. Gage Block and Accessory Sets. (2)Angle-Rite 6” x 11” Precision Sine Tables. 12” x 16” Bench Center. NSK 6”-12” OD Mic Set. Fowler and Phase II 0-6” OD Mic Sets. Mitutoyo 5”-6”, 4”-5”, 3”-4”, 2”-3”, 1”-2”, 0-1” Dial Snap Gages. Mitutoyo 6.5”-10”, 2”-4”, 1.4”-2.4”, .44”-.72” Dial Bore Gages. Mitutoyo 1.6”-1.8”, 1.4”-1.6”, 1.2”-1.4”, 1.0”-1.2”, .8”-1” Bore Mics. Etalon .205-.425 Bore Mic Set. Mueller Dial Groove and Dial Ring Gages. Mitutoyo and Yuasa Calipers to 40”. 36” x 48” x 6” Granite Surface Plate w/ Stand. 24” x 36” x 4” Granite Surface Plate w/ Cabinet Base. (2)18” x 24” Granite Surface Plates.